It's fifteen minutes past three and I've made it to the far end of the biggest shoppingmall in the country, where Muziekcentrum Vredenburg is situated. First a long journey by bus and train from way up NorthEast, then to the Rotterdam area to deliver a bag with personal items that somebody urgently needed so this person would cover my travel expenses for today (smart thinking, right? ), now I'm back in Utrecht. Looking forward to hear lots & lots & lots of music... I find myself waiting in line to buy a ticket! Yes, dear friends, I have to PAY to do my work as a reporter. Nobody could (thanks for trying Theo, Jos and Yvonne!) or would (won't mention names here!) provide me with a free ticket or a spot on the guest-list, so... today no interviews either. To make some sort of point towards the powers that be, I decide to buy my ticket NOT at the counter, but from a man who has the spare one from a friend who got sick. I decide to have FUN for all this money's worth! After leaving coat plus bag in the wardrobe and saying hello to at least nine friends, I try to make that difficult choice between all the acts in the line-up. 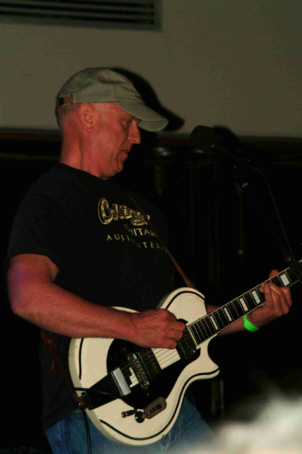 First BERNIE LEADON, no doubt about that! An old hero, I just love all his work with The Flying Burrito Brothers and the Eagles, I've only seen him once live, during that year he played with The Nitty Gritty Dirt Band, replacing John McEuen. He had just before that concert joined them and he was in one of his legendary bad moods because of technical trouble... After the unrehearsed encore left him stranded halfway, he literally threw his guitar in the rack and when Jeff Hannah tried to calm him down by placing a hand on his shoulder, poor Jeff felt a very mean elbow between his ribs!! What a surprise to see the legendary Mr. Leadon, "Wild Man Bernie" as Steve Hill always calls him, appearing on stage in a very pleasant mood. Hubert van Hoof, MC in the Small Room, settles once and for all the confusion how we should pronounce "Leadon" and Bernie grins: "I hope he had something nice to say about me!" He wears casual clothes: jeans, t-shirt with print and baseballcap, where is that big head of curls we used to know? He and his buddy Chris Hillman always joked they were brothers! The set starts off with a few new songs, Bernie plays electric guitar, he has three different ones lined up. He brought Tommy Burroughs with him, who plays fiddle, mandolin, acoustic guitar and he also sings harmony. It's not all countryrock, some songs lean towards the blues, like that one about somebody who "stole my car, stole my ID". In the meantime I hope not the whole audience has trained ears, as there's definitely something not right in the mix, the electric guitar is way too loud and out to kill everything else. "Backup Plan" from the new solo-album "Mirror" sounds real cool with the fiddle and then Bernie finally pulls out a set list: "You like one? ", he asks Tommy and says: "I like one too!" He tells a funny story about a friend of his, being in jail several times, under several different names and the police never put it all together... Everybody recognizes "Bitter Creek" from the first chords and applauds, Bernie's always been such a wonderful guitarplayer, see him use all the effect pedals! He tries to remember when he was in The Netherlands for the last time: "With Run C&W? Or with Chris Hillman?" Nope, all these interesting collaborations never made it this far. "Oh, with the Eagles!!" He is laughing out loud now. "Life's pretty damn good! ", he declares, before starting the most beautiful song he ever wrote, "My Man", his tribute to old friend Gram Parsons. An instrumental with the mandolin follows, then another new song, then finally something from the setlist again. Too bad, Bernie was never a very good singer, he has an average voice, this in combination with the very bad sound turns some listeners off. The last two songs are faster again, more in the rock&roll mode and I'm intrigued by what I hear: "My God's bigger than yours", that's some ironic vision of what's going on in the world... I hope next time they hire a sound-engineer with EARS, but it was just wonderful to see & hear you again, Mr. Leadon!! I stay in the Small Room for CAROLINE HERRING, I happen to have her first CD in my collection. Definitely not bad, so I'm curious. Bryn Bright plays the upright bass with her and Jeff Plankenhorn is there with his (slide) dobro, he made also an interesting album himself and it's nice to see him here too! Fresh-faced young ladies Caroline and Bryn steal the show right away, especially the hearts of the gentlemen, but Jeff also has quite a few fans in the audience, he gets his own applause. No problems with the mix here, Caroline's vocals even sound better than on the album, she has just a gorgeous timbre... 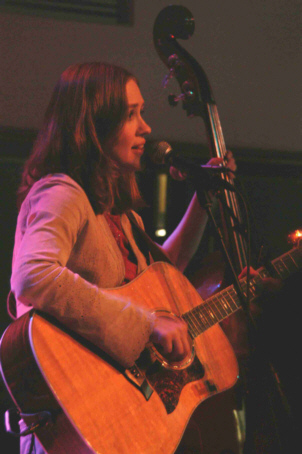 Somewhat like Joan Baez, I would say. Quite a few of her songs are about women, "Colorado Woman" is the second song and then she declares before starting "Wise Woman" that there are many wise women where she comes from, Mississippi. Yes, we can hear that very clearly by her thick Southern accent, especially when she speaks. "Stone Cold World" is not on any album yet, it's about a trip to Newfoundland. She sings "Whipperwill" all by herself, after taking off her beige jacket, the sleeveless red blouse triggers a lot of appreciative male whistling! The stories make her songs interesting, as her choice of words is rather simple, "Mistress" is going way back in history to the times there were still slaves on the plantations and "Heartbreak Tonight" was written about Loretta Lynn. "Devil Made A Mess" was played quite often on the radio here, a traditional is announced as "My favorite duet with Bryn" and their voices blend beautifully, "Mississippi Snow" was inspired by a postcard and the last song turns out to be "Carolina Moon". Then Caroline steals also my heart, by turning her head away when Hubert van Hoof, the MC, tries to kiss her! Attagirl, you don't need some old man slobbering all over you! I decide to go to the Big Room now, it's announced that the line-up will be changed there, because The McGarrigles are delayed. The train Kate McGarrigle is on, has run into a cow... NOBODY believes that, especially not because their new album is called "La Vache Qui Pleure" (The Crying Cow)! After a short pitstop to drink water and take some headache medication, I say hello to yet another few friends and fellow-DJ's, then I'm going to enjoy the last forty minutes of SON VOLT's show! 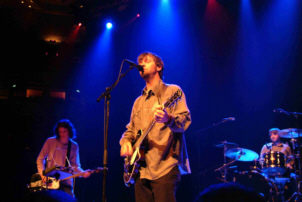 I've seen Jay Farrar at the Rhythm & Blues Night 2003, there he had only one musician with him, but I just loved their concert. And I think Jay is a very nice, quiet person too, at least one performer on the festival who isn't so full of himself! I have to admit that I don't really know the albums of Son Volt, but I'm just caught up in the wonderful melodies and the melancholy right away... Jay plays an acoustic guitar for two songs before switching to his electric guitars, the sound gets more of a "bite", but the lyrics are hard to understand now and that's a pity. The guitarplayer, James Walbourne, uses the slide a lot, I always like that! Yes, we hear now where alt. country originally came from... After a shy "Thank you! You've been a good crowd!" coming from Jay, the band leaves the stage, but the schedule is messed up already so the strict "no encores" rule doesn't apply tonight. Son Volt comes back for one more long song -a George Harrison cover, I think- Jay on acoustic guitar again, drummer David Bryson handling the shakers, lots of solos, wow! Behind me I hear people say that they got better all the time, towards the end of the show, so I heard the very best piece of the best, it was beautiful!!! The McGarrigles are still nowhere in sight, so KELLY WILLIS is on next. I've been looking forward to her show, as I liked what I heard on the radio a few years back, just her and an acoustic guitar. Before that she was one of those pretty Nashville has-beens, plagued by scandals. I assume we all remember those photographs from the 90s, where she and Lyle Lovett (then married with Julia Roberts) leave a hotelroom in the early morning, guitarcases in their hands, very guilty looks on their faces! But those days are over, she's happily married with Bruce Robison now and mother of three children in the meantime. Still looking girlish with her blond hair, wearing a black skirt and a jeans jacket, she exclames that it's "a thrill to be here" and does her bloody best on her performance! But... her voice sounds quite sharp and raucous and she obviously has a cold. She indeed explains that she is bothered by allergies and the long planeride didn't help much, she apologizes for using chewing gum... Poor girl, I know how she must feel! She sings some recent work, from her latest albums, including those titletracks "What I Deserve" and "Easy". A new song she wrote with Gary Louris, something by Marcia Ball and also one of her husband's compositions, she tells: "He has a knack for writing these real sad songs." I like that old 70s song, made famous by The Kendalls, "Heaven's Just A Sin Away". After a few songs Kelly gets going and starts to sound somewhat better, but she still forces her voice and she doesn't have much of a vocal range, so a lot of the songs start to sound the same... Just too bad, as she has a great band with her, they bring some variation to the music, Warren Hood is a talented fiddler, who also plays mandolin, Rob Gersjoe is definitely one of the best guitarplayers around and Chip Dolan leaves his keyboards a couple of times to play accordion. They can't save the show, there's again some technical trouble, Chip makes wild gestures towards the sound-engineer and after exactly an hour this almost painful performance comes to an end with a couple of more rocking songs, one is even a Marshall Crenshaw tune. Yeah, what can I say? 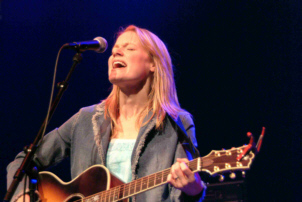 I know too well how bad allergies can get, so I'll give Kelly Willis another chance. She said it herself, that she would come back without the sniffles! Finally, Kate McGarrigle seems to have arrived and everybody is hurrying around to set up the stage. As I figure that will take a while, I'm leaving the Big Room for another pitstop and one more round to find people... It's not so crowded this year, I still think they sold way too many tickets in 2004, there were some potential dangerous situations then. Not only in the Small Room, many people couldn't get in there for the full evening, also in the Big Room where some neckbreaking climbs over the balustrades were performed. Now I want to meet Hans Settler (of course!) 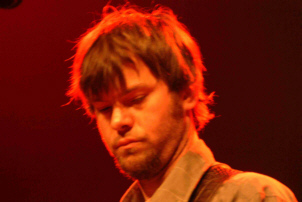 and also Colin Black, an American singer-songwriter who lives in The Hague, discovered by our radio-show Alt. Country Cooking. I see Colin's "paper-trail", he has left good-looking flyers all over the hallways and I'm pleased to see that he quoted me extensively. But... I can't find him in person! Back to my seat, KATE & ANNA MCGARRIGLE are about to begin their show and this is something I don't want to miss. After all, they don't play concerts that often, let alone here in The Netherlands! I like them at first sight, I always have a weakness for ladies in their 40s and 50s who just let their hair go grey, like Emmylou Harris did. And I do love this kind of hippie-folk! The sisters sit on chairs, playing accordion and banjo, there's also a very good fiddle-player, Joel Zifkin. There was no time for a regular soundcheck, so the voices are not loud enough in the mix at first, but the sound-engineers do their best to fix that. After every song Kate and Anna change instruments (and seats), they also play piano and guitar. The third, much younger lady who sings, turns out to be Anna's daughter, Lily Lankin. Conversation between songs is often hilarious, typical family teasing... Anna tells Kate something, Kate says: "Whatever you say, my dear!" and laughs to the audience: "She's my big sister, you know..." The stories about the songs are quite funny too and finally, when "La Vache Qui Pleure" is played we hear what happened during the journey. Kind of, as Kate keeps interrupting herself. Taking the train was already plan B, she couldn't leave Gent (Belgium) because of a bad traffic accident, then the train ran into a cow (it's true! ), close to the first stop. The delay would take over an hour, no buses or taxis available, as always in these circumstances, so Kate, realizing that she could never make it to the stage on time, was in tears. Then a Belgian gentleman came to the rescue and brought Kate in his car all the way to Utrecht, he got a well-deserved applause! A couple more songs are in French, a couple are well-known, like "Going Back To Harlan" and "Heart Like A Wheel", there's an Appalachian melody and of course their big hit "Complainte Pour Sainte-Catherine" is played! The vocals of the sisters are a bit nasal sometimes, but otherwise this is just a great performance! So relaxed, like they're playing in a coffeehouse on the corner or in their own living-room, instead of on a big festival-stage. There's even time for an encore: "Talk To Me Of Mendocino", gorgeous!! A very special concert! Closing off in the Big Room is CHUCK PROPHET and his Mission Express. It's thirty minutes past midnight already, so many people who came by train have to leave, the nighttrains via Amsterdam are not the best alternative. WHY isn't it possible to start the festival at two in the afternoon and end around midnight, so this problem could be avoided? Not everybody drives a car, you know... I've seen Chuck probably twenty times already: various places in The Netherlands, various times in San Francisco, even in Portland Oregon. I wasn't too crazy about the show I attended at the Q-Bus in Leiden, June 2003. Multi-instrumentalist Max Butler had left the Mission Express by that time and Chuck was just rocking away, while I like those alt. country touches so much. But my hopes are high tonight, as (very pleasant surprise!) 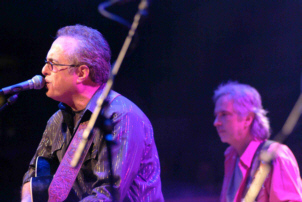 nobody else than TOM HEYMAN plays pedal steel and guitars. Tom used to be the guitarplayer in Go To Blazes, he is currently often on stage in the wonderful San Franciscan bands Map Of Wyoming and The Court And Spark, he is also a singer-songwriter in his own right, I just love his album "Boarding House Rules" with guest-roles for Chuck, Stephanie Finch and Chris Von Sneidern. Speaking of Stephanie, of course she's behind her keyboards now, but I don't know bassist Kevin White and drummer Jeff Anthony yet. Chuck starts off as always, with a one-liner: "This is my deal of festival, no beer, no piss, no mud, I could get used to it!" Wow, this is an amazing show, everything goes just right, even the sound is perfect - finally! The old Chuck is back, even better than ever, no offense to Max - but I'm a huge fan of Tom Heyman!! He sings great harmonies, as expected and just hands the musical opportunities to Chuck, so he can get into his freaky guitar solos and weird sound experiments, often with the additional microphone for effects. Of course he plays lots of songs from his latest album "Age Of Miracles", including the title song, "Solid Gold", "Just To See You Smile" and that funny "You Did (Bomp Shooby Dooby Bomp)"! "Memphis Moon" starts off with the kickdrum and develops just as ominous, being the true story of three teenagers wrongly convicted of murdering three little boys, they became suspects just because they didn't really fit in, listening to goth and metal, very impressive song. "Summertime Thing" is a somewhat older song, according to Chuck: "It has three of my favorite chords, for anybody taking notes!" Then he plays acoustic guitar on "Pin A Rose On Me", what he wrote together with Kim Richey. It's the end of their tour and the band plays very well together, they're obviously exhausted too! Tom leans his arms on the pedal steel and Chuck pets him teasingly on the head: "Everybody has feelings!" Tom just spreads his hands in disbelief... On the side of the stage somebody gestures that it's time for the last song and then that it's time to stop playing, but Chuck ignores all the warnings and rocks on, ending with a duet, Stephanie also playing guitar, both singing in one microphone, just like the old days! There's definitely truth in the saying "keeping the best for last", this was the highlight of today! Oh yes, one more thing: can Tom Heyman have his very own show, next year on Blue Highways? Or let him bring The Court And Spark or Map Of Wyoming, they will blow your mind!